Cardinal Charles Maung Bo was chosed to lead Asian bishops in the Federation of Asian Bishops' Conferences. The mandate of the current holder, the archbishop of Mumbai Card Gracias, expires at the end of December; Myanmar’s first cardinal will take over as of 1st January 2019. – Card Oswald Gracias, archbishop of Mumbai and president of the Indian Bishops' Conference (CBCI). welcomed the election of Card Charles Maung Bo, archbishop of Yangon (Myanmar), as his successor at head of Asia’s Catholic bishops. FABC Acting Assistant Secretary General Fr William LaRousse announced Card Bo’s appointment yesterday, The election took place on 16 November in Bangkok (Thailand), during a meeting of the FABC Central Committee. Card Gracias also announced a “plenary Asian Council of Bishops to discuss different matters about the possibilities of us being at the service of the country, at the service of the people and at the service of the Church in Asia” in 2020. Card. Bo was born on 29 October 1948 in Monhla, a village in the Archdiocese of Mandalay. After studying at the Nazareth Aspirantate of the Salesians Don Bosco in Anisakan, Pyin Oo Lwin, from 1962 to 1976, he made his temporary vows on 24 May 1970, followed by perpetual vows on 10 March 1976. After his priestly ordination as a Salesian in Lashio, Shan State on 9 April 1976, he served as pastor in Loihkam (1976-1981) and Lashio (1981-1983). From 1983 to 1985, he taught in the seminary of Anisakan. Card. Bo served as Apostolic Administrator in Lashio from 1985 to 1986 and its Apostolic Prefect from 1986 to 1990. When the prefecture was elevated to the status of a diocese on 7 July 1990, he was appointed its first bishop. He was consecrated bishop on 16 December that year. St. John Paul transferred him the Diocese of Pathein in Ayeyarwaddy Region on 24 May, 1996., but he continued as Apostolic Administrator of Lashio until November 1998. On May 15, 2003he was appointed Archbishop of Yangon. From 2000 to 2006 he headed the Catholic Bishops’ Conference of Myanmar. 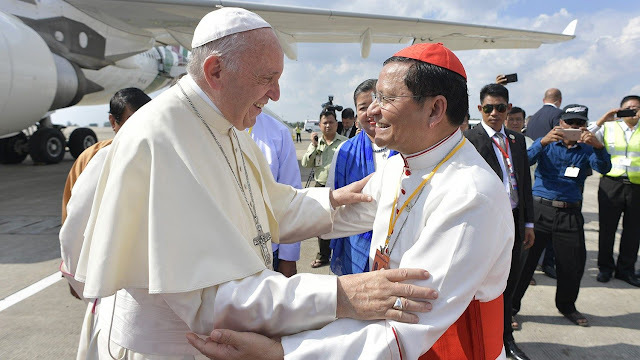 Pope Francis made him Myanmar’s first cardinal at the consistory of 14 February 2015 in the Vatican. Subsequently, he was appointed a member of the Congregation for Institutes of Consecrated Life and Societies of Apostolic Life, Pontifical Council for Culture, and Secretariat of Communication in the Vatican. FABC brings together 19 bishops’ conferences of Asia as full members and 8 associate members. The federation’s purpose is to foster among its members solidarity and co-responsibility for the welfare of Church and society in Asia. The decisions of the Federation are without juridical binding force; their acceptance is an expression of collegial responsibility.